Very kind comments about your recent experience here in Camden, and I thank you. 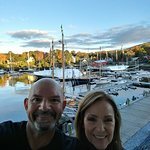 I know there are many great options to choose from when looking for a place to stay in the area, though our hotel does stand out to many of our guests based on our exceptional service and the unbeatable views of Camden Harbor. Thank you so much for your recommendation and I would love to provide you with another wonderful experience next time you are in the Camden area! We started going here 10 years ago and loved it and returned many times. Last year it suddenly changed. 2018 was extremely disappointing. This WAS the best stay in Maine. Upon arrival, parking was a challenge. A bellman had to come from another property. We arrived late and wanted to turn in. We were in the Grand Suite. The bedding stank from body odors. We called and someone came up with an armful of sheets and dumped them on the bed. There is no privacy curtain on the bathroom window. The same breakfast is served on a tray that has not changed for YEARS. For $600 a night, the view from the room is glorious, but that is where it ends. We have loved our stay through the years, but now, management has succeeded in a downgrade! Parking is always a challenge, and hadn't been. Clean bedding??? Are you kidding?? ?Now it will be pet friendly and with the huge tick problem in Maine, do we need to strip the bed on arrival and inspect it and get new sheets??? Really???? First of all, thank you so much for staying with us so many times over the years since 2010 and for taking the time to provide us valuable feedback on your most recent stay this past summer. Our number one goal is to provide guests with a memorable and positive service experience, something that we obviously missed the mark on during your last visit, and for that please accept my sincerest apologies. I completely understand your frustrations about parking as it can get pretty tight during the peak summer months, which is why we provide complimentary bell/valet service to alleviate the stress of finding a parking spot. At times we do share our bell/valet staff between Grand Harbor Inn and our neighboring sister property, 16 Bay View, since we share the same parking facilities. In regards to your linens having an unpleasant odor, this is unacceptable. What is even more unacceptable and embarrassing is that we did not offer to remake your bed with the fresh linens brought to your room. Obviously not customary in any service recovery issue, no matter how difficult or easy the challenge might be. Once again, so sorry. Breakfast here is meant to be a healthy, creative, and memorable part of the experience. I would agree that the breakfast over the years has remained very similar, but what has changed is the sourcing of much more local, fresher ingredients and that just about everything we serve, from the quiche to the muffins, to our signature granola, is now all scratch-made each morning by our very own chef. Though difficult to hear about your less-than-positive experience, we do value and appreciate such honest feedback, especially from guests who have stayed with us so many times in the past. Because without such feedback, how else are we to improve our accommodations and services? There is always room for improvement... Understand that we embrace that concept here at Grand Harbor Inn. Should you give us the opportunity again, we would be more than eager to welcome you back and provide a much more enjoyable and relaxing experience. Thank you again for your feedback. Fantastic, did I say fantastic! Yup! Our suite and staff was fabulous. Well worth the trip to this Maine hideaway. A short walk to quaint downtown if you dare to leave this terrific Harborside with ocean views. Picked up some high quality, hand made, leather goods by local artisans. Support Maine and support USA. The warm, chocolate chip cookies upon arrival, with a warm fire greated us at. Check in. Wow!. Did I say Wow! Oh Yeah, we’ll be back. Nice job folks! the owner of any given shop working away inside. All of us thank you for your kind words on our staff and property, and look forward to your next stay at the Grand Harbor Inn! My wife and I absolutely loved this place! Nice amenities and the rooms were fantastic! Spa like bathroom, double sided fireplace from living room to bedroom. Two accesses to balcony. One through the living room and one through the bedroom. Breakfast served to your room. Chocolate Chip cookies that are out of this world with a TOP SECRET recipe! Thank you for taking the time out of your day to review our property! Grand Harbor Inn is equipped with the latest and greatest amenities, and I'm glad to hear these were a big highlight of your stay. Our kitchen department will also be very happy to hear that you loved the cookies! We hope to see you return soon, and thank you again for the 5-star review. BEAUTIFUL AS THE FIRST YEAR!!! GRAND HARBOR is just as AMAZING as the 1st year we stayed 6 YEARS AGO!! I already booked for next year, this will be OUR 7TH YEAR COMING HERE and we will be CELEBRATING my 50th BIRTHDAY!! The WHOLE staff are GREAT PEOPLE!! THE WORST PART of GRAND HARBOR is the day WE HAVE TO LEAVE!!! Grand Harbor feels like HOME TO US, evey year we come here!!! Needless to say, we loved visiting Camden and the Grand Harbor Inn made it that much more special.